I love to photograph and tell the story of people who work creatively. I also enjoy fused glass, so the chance to visit someone who works with glass professionally was a bonus. Emma Kirkham does glass. And she does it very well. But you’d expect that after studying it and working in the medium for over 25 years. She graduated from Sunderland University with a degree in 3D Design in Glass and Ceramics. Emma does her fused glass work (or kiln-formed glass, to give it its technical name) at her small, Staffordshire based studio. Emma is also a professional glass blower. When I arrived, Emma was working on a set of fused glass badges for a client. This very practical use of fused glass was intriguing as I’d never considered using it as a brand item. Even more unusual were a set of fused glass business cards that Emma had made for herself. The typical business card has a very limited lifespan. Making her cards out of glass meant they were memorable and functional. It’s not as strange an idea as you might think since glass is quite strong. With Emma’s background in glass a number of corporate uses are possible. Emma also makes a range of jewellery items which she finishes off with sterling silver metalwork to make earrings, bracelets, etc. You can see, and buy, her work on her website, and if the exact item isn’t shown she can design and make items to order. There’s something magical about working with fused glass. It’s a mix of technical skills and serendipity. The technical part is in predicting how the glass will behave at different temperatures and setting the kiln accordingly. The serendipity is down to the fact that you can’t predict exactly what will happen when the glass is heated to around 800 degrees Celsius in a kiln. Which is what makes opening the kiln many hours later a delight. It’s a delight that Emma would love to share with others, which is why she is starting glassmaking courses for anyone who would like to explore this medium. 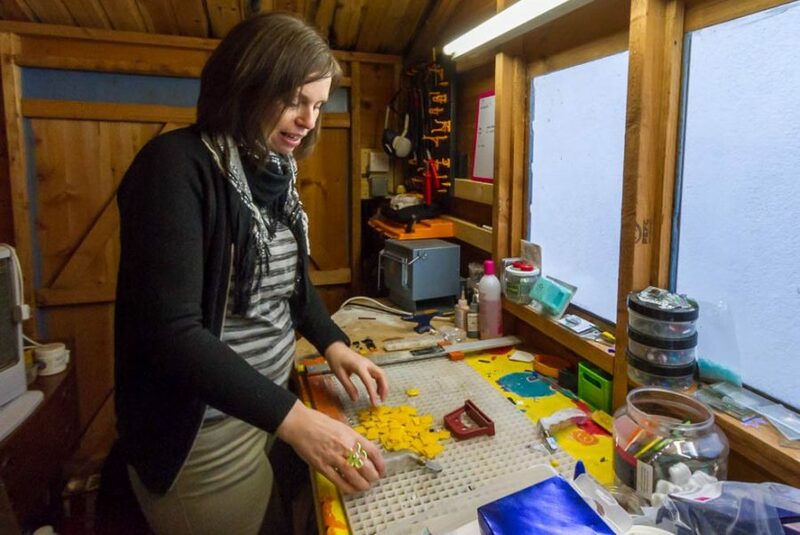 (And as someone who learned fused glass as a hobby several years ago in a different part of the country, I can honestly say it is an opportunity well worth exploring!). You can see Emma’s work and get in touch with here via her website: www.emmakirkhamglass.com.